I believe the drops off the AG's were nerfed because the GM's were sick and tired of petitions regarding camps, KSing and all the unfortunate things that come from a spot where PP is easily made. Drops off Peg Leg in Butcher Block Mountains, every time. This item was easy to obtain prior to lvl 12. My Barbarian BST soloed AG1 at lvl 7 with easy with only newby armor and weapon. Keep in mind that is before getting her spells and pet. It was also before the last patch so she made a small fortune. This item is no longer good for money. As of the last patch The Stein, AG backbones, AG blood vials and the AG head were nerfed big time. Prior to the patch you could get an average of 4pp for each, now you will get an average of 5sp for each. Ive spent a few nights getting into the aqua goblin camps, and there great for money. For anyone who doesn't know where they are, go the docks gate, and head left into a unpathed area. when you hi tthe water you will see orange huts. These are aqua gobs. 95% of the time the goblins will be camped so you will most likely have to wait a few hours for the person ahead of you to let go of their camp. Be wary if your below level 8 or so, because sometimes they can get out of hand. Only keep the stiens, blood, and backbones that drop from the goblins. Drop rate is about 1 in two and they frequently drop more than one valuable item at a time. You forgot the heads. They sell for the same as well. #xyvarious, Posted: Oct 15 2002 at 3:49 PM, Rating: Sub-Default, (Expand Post) These things have been common loot off the Aqua Goblins in Kaladim for over 6 weeks now. I personally have spent 3hrs at their camps and left holding enough steins and other loot that when I sold them I had over 100p in my pocket. It really was more than that but I am not saying how much. Also I have sold them for as much as 4p7g and change if you shop before selling. These things have been common loot off the Aqua Goblins in Kaladim for over 6 weeks now. I personally have spent 3hrs at their camps and left holding enough steins and other loot that when I sold them I had over 100p in my pocket. It really was more than that but I am not saying how much. Also I have sold them for as much as 4p7g and change if you shop before selling. I was running through Kaladim the other day and stopped by to give Peg Leg and his group a hiding when this dropped off Peg Leg. Thought maye it was used for the Kaladim low level armor quests. Yes, I killed Peg-Leg to begin my Epic Quest...and got this as well. That's because they drop off the Aqua Goblins near the BB docks, and people are camping them around the clock, and then selling their drops to their favorite merchant. Dwarves, who have high faction in Kaladim, usually go there to sell them. Yes, my friend, this is that same Stein. They drop off not only the Aqua Gobs in BB, but also the Bandits and Green Gobs in BB. It is used in the Axebringer (Dwarf Warrior) Newbie Weapon quest. 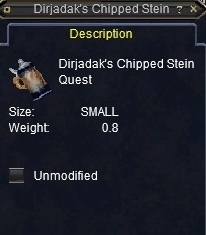 You need this and 2 Pristine Crag Claws (which also go for 3 plat to Merchants, acounting for why it is so hard for the Warriors to get their weapons until they can take the camp from the Farmers) and take them to Dirjadak Barbrawler in the Kaladim Warrior Guild. Of course, the Weapon is No-Drop War only. are these the same ones that are farmed so extensively in BB from the aqua goblins? they sell for 3pp, 9gp and change with apprehensive faction to the dwarven merchants near the camp. GET TO WORK!! YOU aren't being paid to believe in the power of your dreams. That's a rather low price. Kill CrushBone Orcs, to raise your faction in Kaladim, and then get two opal encrusted steins (about 40pp each) to raise your CHA by 50 points (25 for each stein). You'll get 4.7PP instead. That may not seem like a lot, but when you're selling about 100 of these (or more) then that additional 8GP each adds up. My two steins have paid for themselves probably 3 times over. I never go anywhere without them, and I always equip them (at least I always try to remember to equip them) before I visit a merchant.